Copy and paste the URL to view this powerful ceremony. For the past four Christmases, Sgt. John Baker left his wife and son to spend the holiday with three strangers he never knew much about, not even their names. 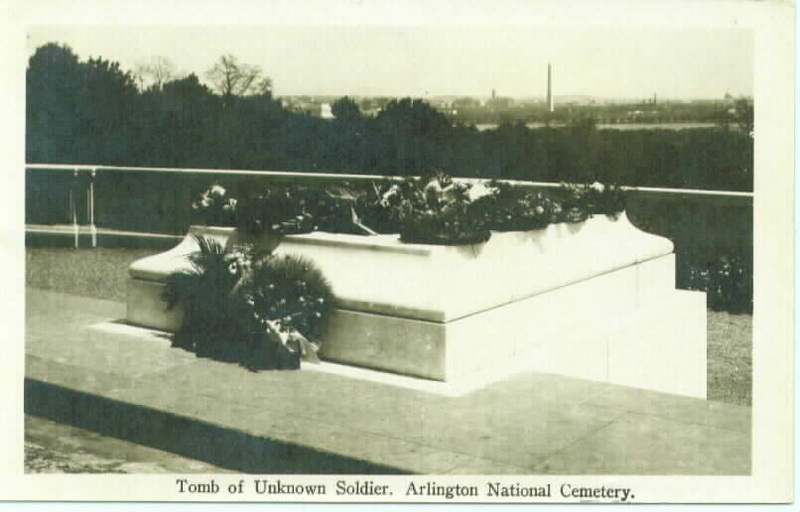 Baker is a Tomb Sentinel, a small group of Soldiers entrusted to guard the Tomb of the Unknown Soldier in Arlington National Cemetery, Va. Sharing his holidays with the Unknowns is a small sacrifice. "I owe them perfection," said Baker. "They not only gave up their lives for this country but they gave up their identities as well. Their stories are an open-ended book that may never be closed." 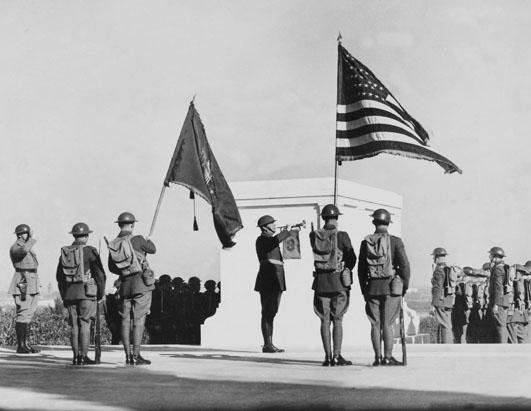 The Tomb holds unidentified remains of Soldiers from World War I, World War II and the Korean War, and is guarded 24 hours a day, 365 days a year, in all weather conditions. On Aug. 31, after taking his last walk, Baker ended his chapter in the Unknowns' story. Reflecting on his first experience at the Tomb, Baker said he never thought he would see the day when he would become a Tomb Sentinel. "When I was 5-years-old, I remember looking up at a Tomb Guard walking with a rifle, standing at 6-foot-4 and I was just in awe," said Baker. "I didn't think that I could do it." His recruiter, however, thought differently. "My recruiter was actually a Tomb Guard who had left the Tomb in 2007," said Baker. "He talked me into going down to the Tomb and set up everything for me along the way." Five months later, Baker arrived to the 3d U.S. Infantry Regiment (The Old Guard). 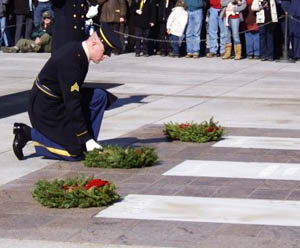 The Old Guard, the Army's premier ceremonial unit, regularly conducts memorial affairs to honor fallen Soldiers. 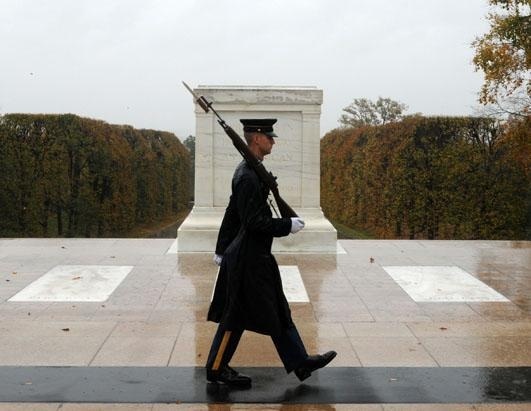 In keeping with this high esteem, a select group of Soldiers guard the Tomb. Baker was determined to be amongst this group. 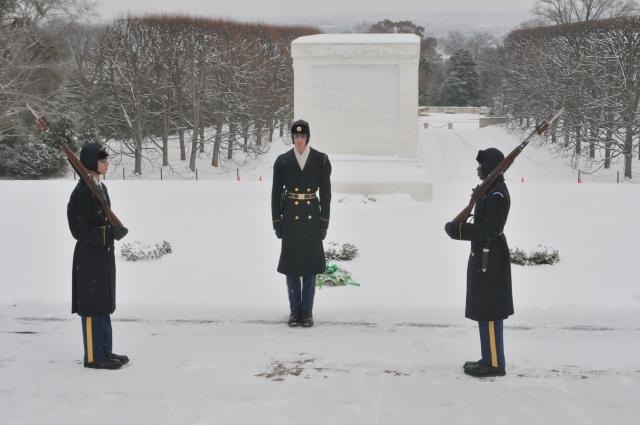 Tomb Guards undergo a rigorous training process which instills the honor, discipline and seriousness necessary to carry out their solemn mission. Baker admitted that going into the training he did not have the right mindset. "It was a little rough at first," said Baker. "I was a 19-year-old kid. I just wanted to have fun. I wanted to have my off time and I didn't want to put in the amount of dedication that was necessary." 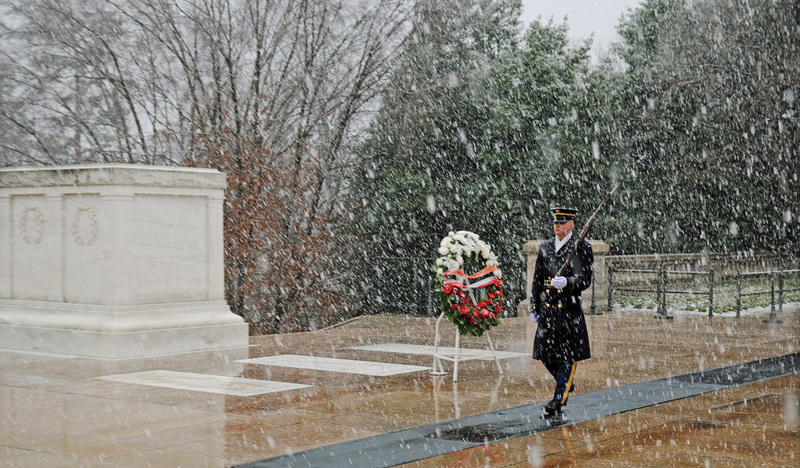 Two months into his duty, Baker realized the true honor of what it meant to be a Tomb Guard. "It was pouring down raining and I was walking and there was nobody out there except one old woman," said Baker. "She was just looking at me and she was crying and whenever I would walk past her she would just say 'thank you'." "I just kept thinking one of them could be her husband that she never saw come home from World War II. That's when what I did really sunk in," he added. He has trouble explaining the exact feeling that came over him from that moment and others like it. "It's hard to put into words when you see those people who really appreciate what we do," said Baker. 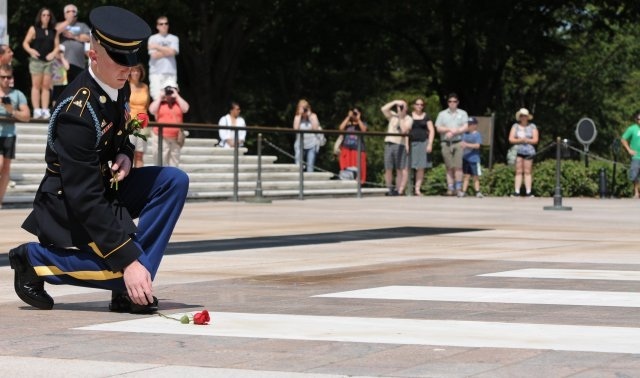 "When a guard changer comes out and requests that the audience stand, I've seen veterans fighting to get out of their wheelchairs to pay their respect to the Unknowns. That's what has really drove it home for me." The sanctity of his service reshaped Baker's mentality. "I have so much pride in my country," said Baker. "I've done something that not a lot of people will do and I hope I've served honorably." A long way from the 19-year-old who started this journey, Baker stood tall on the last day of his duty as a Tomb Sentinel. After walking his final guard shift, Baker relinquished his weapon and prepared to render his final respects to the Unknowns. Walking towards the Tomb, Baker stopped to present his ceremonial white gloves to his mother and a rose to his wife and son. He placed a single red rose at the foot of each crypt and rendered one final salute. With his mother, wife and son by his side, Baker exited the Tomb plaza for the last time. "It's bittersweet, but I know I'm leaving the Tomb in good hands," said Baker. Those hands are the legacy of Tomb Sentinels who Baker said he has watched grow during his time at the Tomb. He will miss this special brotherhood, but most importantly, he will never forget the bond he shared with the Unknowns. "It's a feeling that you can't put into words," said Baker. "I've asked other Tomb Sentinels, past and present, and they can't explain it either. You just know it's there. I feel like I will always have to defend them."